How many falafel recipes can one person have on their blog? Five. The answer is five. Proof: 1 – 2 – 3 – 4. Either I’ve lost my mind or I’m getting really good at making falafel. Fingers crossed it’s the latter. We’ve been exploring our new Portland neighborhood for about a month now, and we’re getting to know our favorite food spots (very important on our list of priorities). One place I’m loving is Wolf and Bear, which serves up vegetarian and vegan Middle Eastern food with lots of gluten-free options. My go-to has been the gomasio salad with falafel. You can add two but I ask for three, because obviously. Now that I’ve had this falafel a few times, I’ve studied its flavors and texture and was convinced it was time to up my falafel game. I think you know where this is going. This recipe requires just 10 ingredients and is expedited with the help of a quick-soak chickpea method I borrowed from The Kitchn. The primary differences between this recipe and my previous attempts are that I start with dry chickpeas, and instead of baking, they’re pan-fried – two improvements I believe make all the difference. The ingredients are so simple, and the flavors are complex and wonderful. Soaked chickpeas are blended with onion, garlic, parsley, cumin, cardamom, coriander, and sea salt. A little oat flour keeps these gluten free while also helping them bind/form into a dough. After letting the mixture chill in the refrigerator for 1 hour, simply form into balls or discs and pan fry. Look at the crispy, golden perfection. Swoon! Find my selection of go-to sauces in the instructions. We hope you love these falafel. If you try them, let us know what you think! Leave a comment, rate it, and don’t forget to tag a picture #minimalistbaker on Instagram! We’d love to see what you come up with. Cheers, friends! 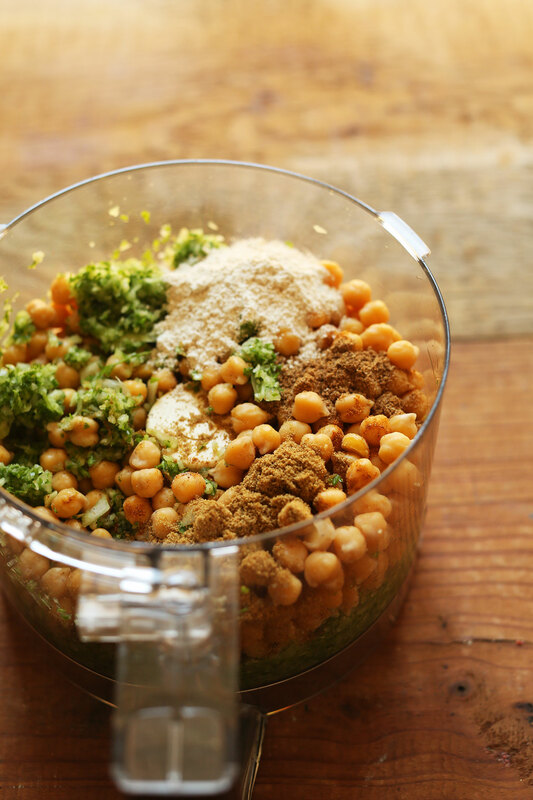 Once the chickpeas are slightly cooled and dried, add to the food processor, along with gluten-free oat flour, salt, cumin, cardamom, coriander, and cayenne (optional). Mix to combine thoroughly, scraping down sides as needed. This may take up to 4-5 minutes to fully incorporate all of the spices and herbs. You're looking for a near paste with only very small bits of chickpeas and herbs. Once your falafels are formed (~24 total // amount as original recipe is written // adjust if altering batch size), heat a large metal or cast-iron skillet over medium/medium-high heat. Once hot, add enough oil to create a thin layer on the bottom of the pan and wait 1-2 minutes for the oil to heat up. Then place only as many falafel as will fit comfortably in the pan and cook 2-3 minutes on each side. Once the bottom side is browned, flip gently as they can be fragile. Continue until all falafel are cooked. Adjust heat as needed if they're browning too quickly, or aren't cooking quickly enough. 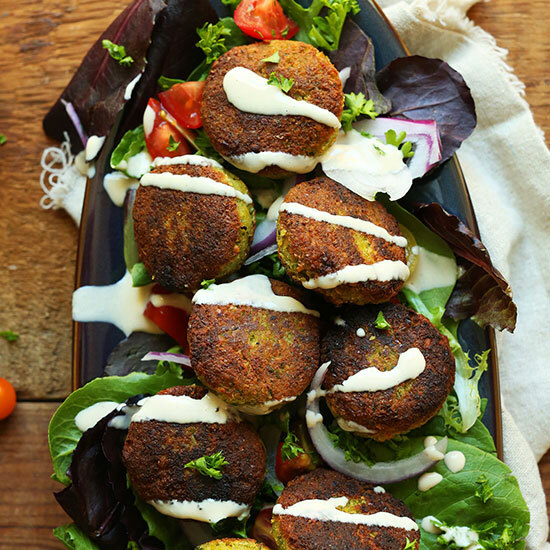 These falafel are delicious on their own with hummus,garlic dill sauce or tahini sauce. I also love garnishing them with chili garlic sauce for heat. Serve over greens, in pita, or enjoy as is! *Nutrition information is a rough estimate calculated with 1/3 cup (80 ml) grape seed oil for cooking 24 falafel. *Recipe adapted from the talented Tori Avey. Amazing. My food processor is terrible so mine were vert lumpy, but I didn’t even care. Doubled the recipe but only put in salt for one batch and it was great! Made these falafel last night (no substitutions/modifications) and they were amazing! We ate ours in pita with some spinach, tahini sauce, and some grilled onions. Yum, will be making these on the regular! They are just disintegrating on me when I fry them… I don’t know what I’m doing wrong! Followed the recipe, my oil is hot, I’m doing them 3 min on each side but by the time i flip them they have just disintegrated into the oil… any ideas? It sounds like they ended up a little too dry. We would recommend using tahini, oil, or some other type of moisture to get them to bind better. Hope that helps! Hello, when I panfry the falafels,will inside of them be cooked through?Sometimes inside will be uncooked if we dont deep fry them. They turn out firm and slightly moist on the inside, but not uncooked. Hope that helps! 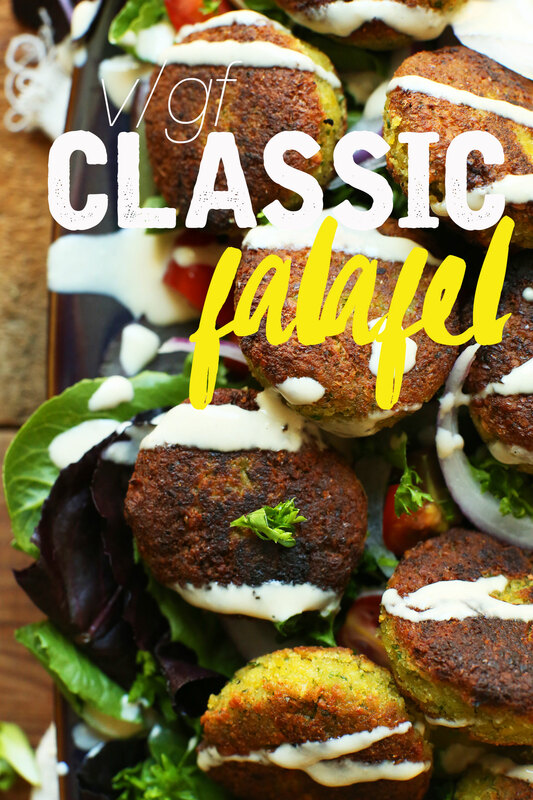 I have tried many falafel recipes and they didn’t quite make the cut…but this one sure does! It was easy, especially the dried bean cooking method, delicious and tasted amazing. This is my new go-to recipe. Thanks for sharing it! Delicious! I made it and it was wonderful. I’m not gluten free so I just used some whole wheat flour I had on hand. It only took 1 minute to mix everything throughly. Would definitely make again. Tahini sauce- you can find the recipe here. Hope that helps! This recipe was sooooo easy and even more delicious. I am picky with Falafels but my hubby and I both agreed they are pretty damn good. I will surely make them over and over again. I used trick from vegan meatballs to dry two cans of chick peas and worked like a charm! (I forgot to buy dry ones) thanks so much for the awesome recipe! Can I use dry parsley? Yes, that will work in a pinch! Made exactly as directed except did not use flour. Was not necessary. I fried some and baked some because I can’t eat a lot of oily things, I have heart problems and certain foods make my heart go crazy. Anyway, both varieties held together great and were very tasty! The fried ones are definitely better and I served those to my family. I ate the baked ones on a salad topped with your tzatziki sauce. It was delicious! I might cut down on the salt next time. I also might use canned garbanzos next time if I BAKE them, as suggested by another reviewer because they were quite dry. I know you don’t recommend baking for this recipe, but that’s just what I have to do, so I will try cooked chickpeas for that reason. Wow! Wish I’d read the whole recipe before starting. I thought the timing for ‘cooking’ the beans was incorrect & cooked my dry garbanzo beans. Uugh. Figured I’d try cooking them anyway. They fell apart in the pan. Any way to salvage? Thanks. can one use canned chickpeas instead or do they have to be soaked overnight and just processed from dried? You can, but the recipe will not turn out as good! So, ultimately I would.be better off with the flour or dried form?? Made this and it was really good. But I couldn’t get the patties flat enough to brown up nicely like in the photos. I feared that if I added more flour it would be too dry. Any suggestions? I used regular flour since that’s what I have and I’m not gluten free. I’d recommend using more oil and cooking them for a bit longer! I enjoyed them and they were easy to make. We are glad to hear that, Mary! I added smoky paprika as we use to at NF deli I use to work at! Thanks for the recipe! 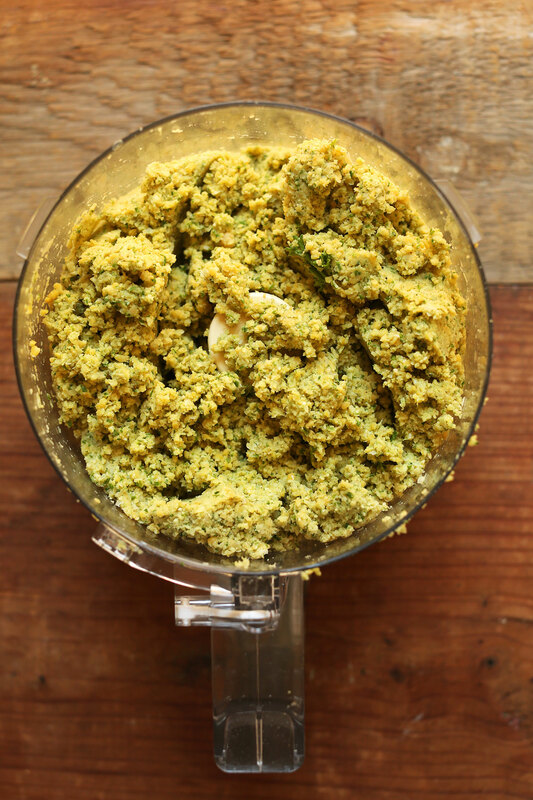 I have chickpea flour to use up….. Is there a way to use that for falafel? Sorry..not for this recipe, Denise! Oh well….This recipe sounds delicious. I’ll try it and find some other chickpea flour uses. I’m sure I had something in mind when I bought it…..maybe chickpea flat bread. Thank you! I made this last night for dinner and my family loved it. I tried to substitute canned garbanzo beans and it was an epic fail when I tried to fry them. However, I was able to save them by baking them and the flavor was excellent. I learned my lesson, and I will be trying this recipe again with dried garbanzo beans. Thank you for this recipe. I made them tonight for dinner and they were delicious!!!! Delicious! I made 19 little patties, and felt full from eating 7 in 3 lettuce wraps with kale. Unfortunately I didn’t make it into a paste, so I had little bits of hard chickpea, but next time I’ll blend it longer in my Vitamix. Yay! Glad you enjoyed it, Anna! I made this last night and they were delicious! I used canned chicpeas, added one tsp of flour and would use way less salt next time. Used them in a wrap – love the recipe! Hi Tara! We have only tried baking ones that had already been pan-fried and frozen. They weren’t as good as the fresh ones, but still good. I would still highly recommend pan-frying, but if you want to bake them, I’d suggest 15-20 minutes at 400-425 F. Spray them with a little cooking oil for crispness. Good luck! I tried this for the first time last week! It’s sooo good!! I had never made or tasted falafel before. Now a new favorite! Though we aren’t vegetarians, I do like to have a few meatless meals. My meat-lover husband couldn’t get done telling me how much he loved this meal! I served the falafel on a bed of greens with a choice of tahini sauce or dill yogurt sauce and fresh pita bread. Absolutely amazing! Thank you for the recipe! Yay! We are so glad you enjoyed this recipe, Anita! Feel free to share a photo using the hashtag #MinimalistBaker on Instagram and we’d love to see what you cooked up! Hello Dana, would this recipe be suitable to bake in the oven rather than frying? can i use frozen chickpeas instead of dry ones? thanks a lot! Hi Liat! We’ve only tried baking ones that had already been pan-fried and frozen. They weren’t as good as the fresh ones, but still good. I would still highly recommend pan-frying, but if you want to bake them, I’d suggest 15-20 minutes at 400-425 F. Spray them with a little cooking oil for crispness. Good luck! Can you freeze some of the batter (?? before its pan fried) to save for later? Have they, post freeze, turned out as good?? Thanks!!!! We wouldn’t recommend freezing the batter! To freeze, pan fry falafel and let cool. Then add to a freezer safe container and freeze up to 1 month. Reheat in a 375 degree F (190 C) oven until warmed through. I am new to falafel! I recently purchased some and my family had mixed feelings about them. Tonight I made these and have to admit that I used 2 cans of Chickpeas (time was short!) I did dry them first and followed the recipe I also added a tablespoon of Moroccan spices (don’t think this added any extra flavor). They where lovely and moist not wet they shaped well and cooked very well my family loved them and I will be making them again! Thank you for a beautiful recipe that I can add to my families favourite meals. Hi Gabriele! It sounds like you’d probably want to blend them a little longer and that should help! Made these tonight! First time trying the soak method with the chickpeas and it worked well. Next time, I’ll try omitting the flour since mine were in a pretty good, moldable state prior. Also, for those wondering about baking, I baked mine on parchment paper at 400 degrees for ten minutes total (no oil), flipping once halfway and was happy with them in naan with the tahini dill sauce listed here! Thanks for another great recipe! Absolutely delicious! I opted to omit the oat flour and cooked them in an air fryer. I sprayed them with canola oil, and they were in the air fryer at 390 degrees for 12 minutes. They were probably a bit more crumbly than you’d like, but I expected that going in since I was using an air fryer. Served in a warmed pita with taziki, feta and tomatoes. I’ve tried making homemade flutes for ages and this recipe is the 1st I’ve tried that worked!!! And tasted awesome! This will be a weekly go-to for me as they’re super affordable to make with dried chickpeas. I’ve made these twice – once pan fried & once deep fried and both times they were sensational. I eat a LOT of falafel and they’re probably the best I’ve ever had. I daydream about these (probably) a bit too much, and people ask me to make them again all the time. Highly recommended – this is the kind of recipe that makes you look reeeeeeeally good in front of friends & family. Delicious! Although, I did use canned chickpeas for convenience and I plan on trying with the dried. I used a combination of parsley, cilantro and mint. I placed them on a bed of spinach and topped with my spicy black bean hummus, garlic sauce, tzieke sauce, tomatoes and scallions. SO GOOD! I ate at Wolf & Bear when I was recently in Portland; does this recipe taste like their recipe? Wolf & Bear had the best falfel I have ever eaten! Do you know what was in the sauce that came with the falfel? I love this recipe so much. I had never made falafel before, but have now tried this recipe a few times, and I love it. I like to serve it as a falafel burger on toasted whole wheat sesame buns with garlic chili sauce, spinach, cucumber tomato — “all the fixin’s.” Thanks so much for this recipe and your site. I’ve attempted a few different falafel recipes over the years, but they’ve never turned out very well. I decided to give it one more try with this recipe, and it came out PERFECTLY. I’m so excited to have a go-to falafel recipe now! Thank you! I want to preface this with how much I love you blog. This is my first ‘flip’. I made this recipe and 7 cloves of garlic was way too much. I couldn’t eat them (I even added more chickpeas to dilute the flavour). I really like garlic, but is that perhaps a typo? Hi Katie! If you want next time add a little less garlic! These turned out great! Great flavour, great texture, fantastic recipe :) Served with homemade pita’s and salad. I’ll be making these again! Great Falafel thanks, yum from New Zealand….. I just made these and they turned out awesome, but I should’ve paid attention to the prep time first. Hour to soak the beans and an hour sitting in the fridge- we weren’t eating dinner til after 9:30pm. My mistake tho! Keeping this one for sure!! Dana, I love all the food you publish and cook. Today I am going to try this falapel recipe, thanks a lot . Have you every used almond flour or coconut flour to bind instead of the oat flour? I am trying to stay as grain free as possible. Hi Ali! We haven’t tried it, but if you do let us know how it goes! I just made these, thanks for the recipe! My first time making falafel!! Couldn’t find any cardamom (ground) in the shop so had to skip that, was slightly worried with the raw falafel as the garlic was extremely overbearing, thought I had messed something up. Cooked one to test the theory thinking I’d have to balance out the flavours with more chick pea but it tastes great! I did use more than 300g of chick peas however :) thank you for the recipe! Thank you for creating this recipe and sharing it with us. Ii was my first time making falafels and they were so good! My family also loved them. Sister told me they tasted exactly like the ones she had in a café previously. Is there a way to bake this to make them oil free? If so, how long should I bake on each side for and temperature? Hi An! We tried baking, and they didn’t have as much flavor and were a little harder for some reason. Sorry! This was the first time I’d made successful falafels! Thank you for the recipe and the tips…… they looked just like yours and didn’t fall apart in the pan. And delicious, did I mention they were delicious? Thank you so much! ? So I don’t cook the chickpeas? Rinse (uncooked) chickpeas in a fine mesh strainer and add to a large pot. Cover with 2 inches water and bring to a boil over high heat. Boil for 1 minute. Then cover, remove from heat, and let set for 1 hour. Then drain and lightly rinse and dry thoroughly. Can I bake them in the oven and what would be the temperature and the time ? Hi Brenda! We have only tried baking ones that had already been pan-fried and frozen. They weren’t as good as the fresh ones, but still good. I would still highly recommend pan-frying, but if you want to bake them, I’d suggest 15-20 minutes at 400-425 F. Spray them with a little cooking oil for crispness. Good luck! Amazing! Honestly, you’ve just made my day. I’ve been a big falafel fan for years, but never managed to make one myself (it either fell appart, was tasteless or just wasn’t anything like falafel). But this…this I am pinning forever. It is tender and crunchy and perfect. Thank you :). Now I have no reason to go out for one anymore. I love simple recipes, this one is just what I was looking for! Hi can I make this with canned chickpeas? Have you ever made the chickpea mixture and refrigerated overnight? I am hoping to make these for a dinner party but would like to have some of the prep done ahead of time. Thanks! Made these and they were lovely!! Thank you for the great recipe. I’ve made a few others from your site – you’re very talented! Just made this recipe! Best falafel recipe I’ve ever tried. Thanks so much, keep up the good work! Dana, I love this recipe! This is the best ever falafel recipe I’ve ever made! Great job! Keep up with your great recipes. I made these last night. Easily the best falafel I’ve ever made, and close to the best falafel I’ve ever had (which was in Paris—and I’ve lived in New York). For reference, I would also check out the Serious Eats article on making falafel this way. I kind of used both that recipe and this one and combined them. I often do that to customize recipes to my preferences. For instance, I used a lot more parsley (you could also use cilantro or mint or a combination thereof, but I only had parsley). About two cups loosely packed. Falafel should be green on the inside. Also, I did not use any flour as a binder. The Serious Eats article talks about this. You have to be more delicate with forming the balls, but as long as your oil is hot enough, they will not fall apart when they go in. How do you know if your oil is hot enough without a thermometer? I used the method of placing two popcorn kernels in the oil as it heated, and once they pop it’s ready. Thanks, Cook’s Illustrated. I normally hate frying things—just too much oil/mess—but I shallow fried these and they turned out great. Next time I might try baking half the batch just to see the difference, though. I would bake them on a preheated cast iron pan at a high heat. Thanks so much for this recipe! It makes exponentially better falafel than using canned chickpeas, and the “work” of leaving them to soak (I just soaked them overnight) is minimal. This is delicious! I’ve had a lot of restaurant falafel and this is so good. Plus I don’t feel too guilty eating it. Thank you!! My two teenage girls and I made these last night and they were delicious. We served them in whole wheat pita pockets with shredded lettuce and tsaziki sauce. My only regret is that I didn’t make my own yogurt and cucumber based sauce. The next day they were great after one minute in the microwave. I feel inspired now to make some healthy veggie burgers now that I see how easy it is to make the dough is a food processor. Can you freeze these before pan frying? sadly my husband doesn’t share in this kind of wonderful food so it would be nice to have some in the freezer I can make up the following week. I would recommend pan-frying the falafel, cooling them, and then freezing them in a freezer safe container for up to 1 month. Reheat in a 375 degree F (190 C) oven until warmed through. Excited to try the recipe! I cook oil free in my kitchen, can I bake them instead? Hi LeeAnn! I tried baking, and they didn’t have as much flavor and were a little harder for some reason. Wow! I made this yesterday for company and it was a huge hit! The batter was the perfect consistency and didn’t need any adjustments. Super fast to prep once the beans were soaked, and I baked the falafel balls at 350° for 25 minutes. BEST falafel recipe I have ever tried and I will definitely be making this again! 1. 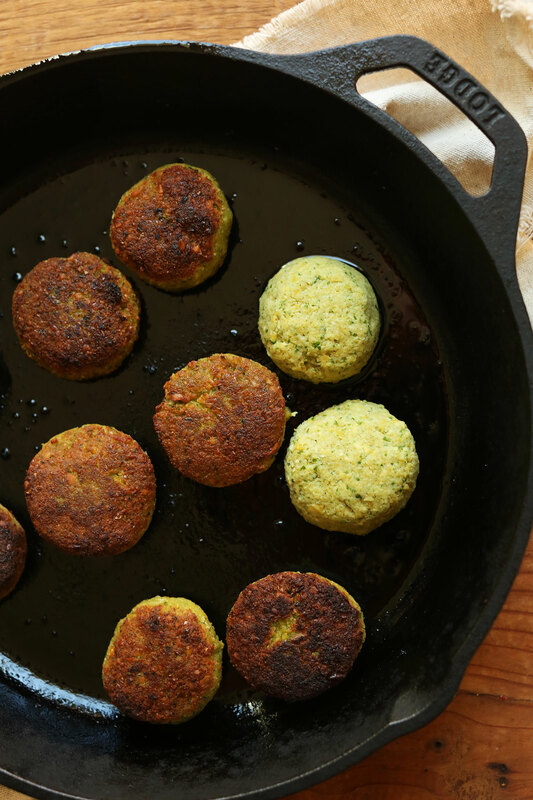 Can you freeze the falafel before you pan fry them and defrost and pan fry when needed? 2. Can you use regular all purpose or whole wheat flour as a substitute? Hi! 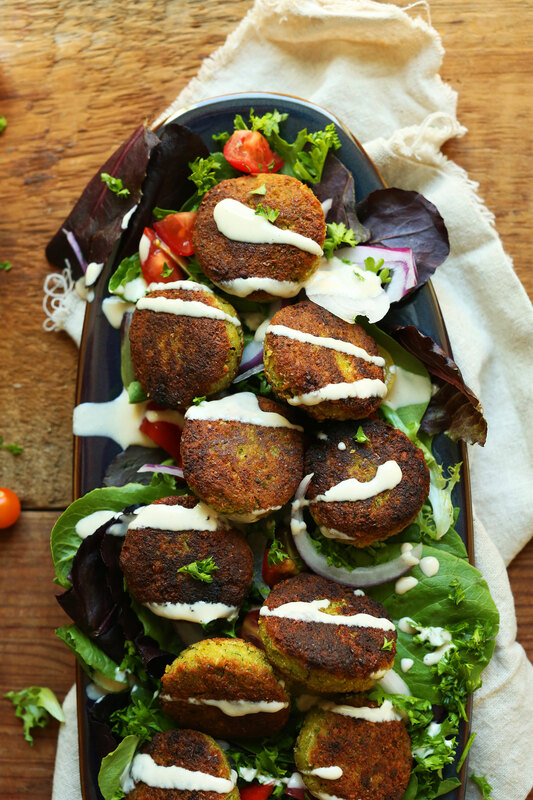 To freeze, pan-fry falafel, let cool, then add to a freezer safe container and freeze up to 1 month. Reheat in a 375 degree F (190 C) oven until warmed through. And yep, all-purpose flour or whole wheat will work just fine! Good luck! Another night’s dinner for the win. I read the “I made this” comments and made some adjustments as necessary being that I don’t have a food processor. One thing I would add is that my chickpeas were a little crunchy (I used the method above). I chose to bring them to a boil for a minute again, then let them soak for 10 more minutes. It seemed to do the trick. Chopping the parsley, onion, and garlic very fine instead of using a food processor seemed to do the trick just fine. I split the mixture into 2 batches when putting it in the blender. I unfortunately only had EVOO to fry them with, and they soaked up all the oil. I would suggest lightly spraying or only a little EVOO to cook them with. The flavor was great, although if you’ve had Middle Eastern falafels before, it wasn’t quite the same. I was still super happy with the result! I served mine over a bed of butter lettuce, squeezed it with lemon, and sprinkled za’tar over the top. Chickpeas don’t fair well with me. What other bean can I use?? Hi! Hmm you could try lentils or kidney beans? I have not tried it though, but if you give it a try, let me know how it goes! This is now my new go-to falafel recipe. Couldn’t have been easier and they were oh-so-good! I left the mixture in the fridge for 4+ hours so I was a little worried they’d fall apart when cooked but they held together wonderfully and didn’t even dry out or crumble during reheating as leftovers the next 3 days. I do think using dry beans vs. canned made a big difference. I’ve never had any falafel or even chickpea burgers have this great texture and hold together this well. Thanks, Dana! Just made this recipe subbing in cooked lentils for the chickpeas. Very tasty! Hi – I really enjoy all of your recipes. I have a question about the Falafel though and I was wondering if you could help. Forming the balls was really easy, but when I flipped them, they couldn’t hold the shape. I’m really not sure what I did wrong. Do you have any suggestions? Hello, I really enjoy the recipes on your blog. I went plant based 16 months ago, and am happy with the food and down 38 pounds. :) I do have to adapt some recipes since I live in Costa Rica and some specific food items are not available or very difficult to find. Usually, I purchase fresh chickpeas (no need to soak, just cook or refrigerate until using) at my local farmer’s market. Any recommendations on how to use them for this recipe? Perfect to make a big batch and eat for lunches! My only comment is that I followed the instructions exactly and ended up with much less than 24 falafel – about 15 I believe. Either way, they still tasted delicious and deserve a 5 star! I got several compliments on how flavorful they were. I don’t know how I would survive without this amazing blog and your cookbook – You make vegan so easy. This is hands down the best falafel I have ever made – or eaten! Thank you so much for all the delicious, healthy and lovely recipes on your website. I give this website a 5 stars. It made me enjoy baking reading your stories and instructions with helpful pictures. Your pictures make a huge difference also in that it lets us know how the recipe should be progressing. I’ll be trying this falafel recipe. These are awesome! Found that when frying the first batch too much oil was used and it broke the falafels, using a little less oil ensured the rest turned out just fine! This is definitely going to become my go-to falafel recipe. LOVE!! Just felt compelled to share… I BAKED these and put them in a warm pita with tomatoes, cucmbers, arugula and tahini sauce and they were sooo good!! I just made these falafel today and was disappointed with the texture of them. Mine turned out really rubbery. I just got a Vitamix to replace my food processor that recently died. I used it and the mixture turned out to be more like a paste instead of the crumbly mixture I got when I’ve made your Easy Vegan Falafel recipe using my old food processor. Do you think over processing could have made them rubbery? Or could it be they way they were fried? Any suggestions would be appreciated, as we generally love the way your recipes turn out for us. Thanks! Hmm, sounds like that might have been part of the problem. Mine have never turned out rubbery! Thanks. Next time I’ll try the Easy Vegan Falafel recipe (that has always turned out for us) in the Vitamix and see whether I have the same problem. Would a 3.5 cup mini food processor work for this? Hi Madeline! Yes you can, you may need to do it in batches though! Yesss and yihaa. My first not-falling-apart-falafel. For the lack of gf-flour I used gram flour instead, which worked fine. I really liked the taste and the structure, but I ‘m gonna cook/soak the chickies a little longer next time – they seemed a bit too raw and crunchy, also had a hard time processing them. This was the first time I’ve ever made falafel at home and haven’t been bitterly disappointed. The texture was wonderful! And your mention of Wolf and Bear’s inspired me to make zhug for the first time, too. Also awesome! Thank so much posting this recipe! Yum! Really good. My boyfriend says it derserves more than five stars. I added a little cilantro and toasted sesame seeds to the mixture. Thanks for another great recipe. These are amazing! My 22 year-old ate the entire batch in one sitting. Yum! Can u refrigerate the mixture overnight? These tasted great but mine we’re mushy in the center. I sub’d whole wheat flour for the oat flour and added egg replacer and used canned chick peas. Do the chick peas from scratch make the difference from firm to mushy? They do! We actually don’t even cook the chickpeas all the way through. Instead, we use a quick-soak method and then add them to the mix after drying them thoroughly, give it a try next time and I think that will help with the mushy center! I’ve been meaning to write and say a huge thank you for your food blog and all of your wonderful recipes. I made your hazelnut cake this weekend and am making your falafel tonight. You do a phenomenal job! I just made falafels from this recipe for the second time. They were absolutely delicious. Thanks to this recipe, I no longer have to drive 20 minutes for my falafel fix. The first time, I fried them according to the directions. This time, I fried them in the airfryer. The falafels were just a smidge drier than the pan fried but not enough to make a real difference. A little extra sauce makes up for the slightly drier falafel. Thanks for a great recipe. Thanks to your tip, I did it on the airfryer too. It was just like you said. My wife thought it was a little too dry, but I think the “healthiest” part compensates. Hi! I want to try this in Airfryer too. How long and what temp? Thanks in advance. Yum, another great chickpea recipe, packing a protein punch with flavor ???? You did it again Dana! I made these falafels tonight for dinner after eyeing the recipe for over a week! I followed the recipe exactly and had the falafels with the tahini sauce in the recipe (to which I added a bit of lemon, fresh garlic and pepper). These were so delicious, moist, crunchy on the outside, earthy and oh so delicious! I will be making them again very soon I think. I made the falafels exactly according to your recipe and the taste was reaaally great! But the problem was that they did not stick together well when I tried to fry them. Many falafels just fell apart so that frying them was impossible! Any tips on how I can do it better ? I’ve heard good things about the soaked chickpea method. The falafel is supposed to have a better texture this way so I’d like to give it a try. My question is: do you think the soaked chickpea method would work in your Better Than Restaurant Falafel? Just substituting the typical 1 1/4 cups worth that come in a can with equal amounts of soaked chickpeas? Please let me know what you think. The taste of this was great! However, I really struggled to get that pretty, brown “crust” on the whole falafel. Mine also fell apart, but maybe there’s just some technique I’m missing since it was my first time making falafels. I’ll definitely try again! I made these tonight. 3 out of 4 kids+ husband loved them (the 2 yo wasn’t doing it!) I have just recently discovered your site & haven’t had a bad recipe yet-the chocolate beet cupcakes were the best! Thanks for all the great recipes! I just LOVE falafel but have never made it at home. Your recipe looks easy to make and sounds delicious! Thank you for sharing!! Would I be able to make this in a blender? Unfortunately I don’t have a food processor… would the texture still come out the same? I’m often afraid to make some of your recipes that require a food processor because I’m worried the texture wouldn’t be the same in a blender and it would ruin it! Please let me know :) Thanks! I’m so excited about this! HEALTHY FALAFELS!!!! Thanks! Another quick question – Could I use all-purpose flour for this? That’s what I have on hand. If so, would it be the same amount (2 tbsp)? Another win! Awesome! I did add some lemon juice (and a spoonful of nutritional yeast) to my tahini sauce (cause I like it best that way). The flafels came out awesome. I hesitated but added an extra tablespoon or so of water to the dough at the very end and I don’t think it hurt. It helped the insides steam up nicely – I prefer my falafel slightly less crumbly – while the outside got golden. What I love most about your recipes: I don’t worry about having a “bad dinner night” from a recipe fail. Your measurments and taste buds are consistently spot on! This is the first time I made falafel at home and your recipe made it so easy that I will definitely do it again. And it’s sooooo delicious. I cheated and tasted one while the rest was still cooking and I have to admit, it was very difficult not to eat the whole batch at once right there at the stove. Fortunately my toddler son gave me his sad puppy look – meaning: mommy, and what about me? – so I took all the strength in me and delivered the rest to the family table. Thanks for this awesome recipe, your blog is my number one choice when I look for something healthy and quick and I’ve never been unsatisfied. These were spectacular. I made them exactly as directed. They tasted like good restaurant falafel. My kids loved them. Served with a tahini sauce, hummus, and Israeli salad in pitas. I will absolute make these again, and I have no reason to try another falafel recipe! Love these! First time I’ve used the dry chickpeas…. I’ve always heard they were better for falafels, but thought it was too time consuming… So happy to be wrong! Thank you so much for ask the great recipes! SO GOOD! I made these last night as directed, and have made a veggie-burger sized one for myself tonight. You mention that you didn’t like the texture after frying/freezing/baking. Do you think it would work to freeze the “dough” raw and fry from frozen? I just want to add: I discovered you accidentally by a link, and I am SO glad I did! The Pulled Pork was great! The Falafel was wonderful! Now I’m browsing your site and trying to decide which sweets to have! I’m wheat-free and vegetarian, leaning more and more plant-based. You make it easy! See my tips above to other commenters! I love your recipes, and everything I tried turned out great. Just thought you’d like to try it this way also. Falafels are one of my favorite dishes because they are really tasty and you can change what you use to cook them and change the sauce. I am in LOVE with falafels! I definitely have to try this recipe out asap! I am really trying to incorporate more vega recipes into my diet and falafel is something which I haven’t yet tried but will have to now give them a go with this recipe. Can I use regular flower? Dana, your tahini date bomb post mentioned Dark Chocolate Almond Butter Snowballs, but I wasn’t able to access the recipe, even though I am a subscriber. Perhaps because I am not on Instagram? I just subscribed recently, so was not around for the March post. Is it possible to get this recipe? It pushes multiple buttons:-) Thank you! So, I’m assuming I can’t use canned beans for this recipe? That’s what I’m wondering too.. It’s all I have a home right now and really want to make these!! I made these falafel yesterday, followed the recipe exactly. I tried the quick soak method for the chickpeas too. I really like the seasoning and flavour of the falafel, but unfortunately found the texture to be very crumbly, and falling apart when I tried to flip in the pan. They formed into balls easily enough, and were not dry before cooking. After being cooked, the falafels were rather like hockey pucks. Any suggestions? I used the oat flour to bind them as the recipe suggested. Every time I’ve made a falafel that came out dry, it was because I was tempted to add some kind of binder. I’ve come to the conclusion that my Lebanese and Israeli friends have always insisted upon–that real falafel is only ground, soaked chickpeas, NO FLOUR NECESSARY! Some individuals include a bit of baking powder for lightness, but really, if you make the above recipe and exclude the flour, your falafel should still hold together. The key is to press the patties between your hands firmly, but not TOO firmly–you don’t want the dough to be too compact, making them dry and hockey-puck-ish, but they obviously have to hold together (refrigerating or even freezing for a short time can help the moisture absorb a bit and facilitates forming the patties in my experience). You have to have a light hand if you’re pan-frying them, because the true danger of crumbling comes in the flip. As long as you’re gentle (I use two small spatulas to gently flip them), it will work fine, but you can also avoid the problems by deep-frying (you don’t need that much oil if you use a small-volume pot) or by baking in the oven (high temperature for short time or under the broiler–you want a short burst of really hot air to make the water inside burst into steam and make them fluffy). Sorry to hijack the thread–obviously, everyone has their own method. If you decide that you’d prefer to bake falafel, I would actually suggest using a different recipe with already cooked chickpeas–the uncooked chickpea method, while authentic, does not yield very moist falafel when they’re baked, in my experience. But falafel are wonderful, even when flawed, after all, so experimenting is never a bad thing! I only have a mini food processor so I’m going to try this in my Vitamix. I have a recipe for hummus in the Vitamix so this should work as well, yes? I’ll let you know how it goes. It mixed up beautifully in the Vitamix, now it’s in the fridge melding its flavors. Thank you for the Vitamix tip!!! I was starting to think I was going to burn the motor out on my mini food processor. Duh! Why didn’t i think of the Vitamix in the first place! I put it on variable speed four and dropped in the onion, garlic, and parsley. Then shut it off and added the chickpeas and everything else, and turned it back on to variable 4 and used the tamper to keep it all going. I’ve used my Vitamix for so many things today; almond milk, carrot ginger turmeric smoothie, potato pancakes, cashew sour cream, applesauce, carrot juice. Yesterday I made the super powered orange juice and carrot apple muffins. Feeling good, feeling strong! This looks so good, I am soaking the garbanzo beans right now. One question though, you don’t actually cook the beans? Only boil one minute and leave 1 hour? Also making your hummus so it sure will be a middle eastern feast tonight. Thanks for all the great recipes. These are, without a doubt, the best falafel I’ve made. I’ll never make a dry, or soggy falafel again! Thank you! This recipe was AWESOME! This was my first falafel experience, it was yummy and super easy to make! I can’t wait to try more of your recipes! Hi! Love your recipes! I can’t have garlic— should I just leave it out or replace with something else? Thanks Dana!!! Hmm, leave it out sadly! So sad!! Compensate with extra spices. This looks so delicious! I love falafel, and I’m so happy to see your vegan and gluten-free recipe. I used to live in the middle east so am used to excellent Falafel practically at every second corner. Now I’m in Europe and still haven’t found any good Falafel here. Maybe I should try making some myself (we do make our own humus of course) but I have an aversion to frying anything but eggs or pancakes (hate the smell of frying oil). Two comments: “real” Falafel should not have any kind of flour in it. It is considered a “cheap filler” and is looked at by Falafel connoisseurs with contempt – I know this is not the case here, but a point you might want to consider. Second – I didn’t see any freshly squeezed lemon juice in your Tahini recipe – really an essential ingredient, in my opinion. I don’t find fresh lemon juice necessary in tahini sauce, personally. I love how flavor of the falafel are offset with the subtleness of the tahini sauce. But thanks for the tip! hi Dana, how am I supposed to keep up with them all?! I just made the Falafel for the first time last night. It was wonderful and I loved how easy that recipe was (and that I got to use up the swiss chard in my garden)! Hi, can I bake them instead of panfrying them? I only tried baking ones that had already been pan-fried and frozen. They weren’t as good as the fresh ones, but still good. I would still highly recommend pan-frying, but if you want to bake them, I’d suggest 15-20 minutes at 400-425 F. Spray them with a little cooking oil for crispness. Good luck! These look absolutely delicious! 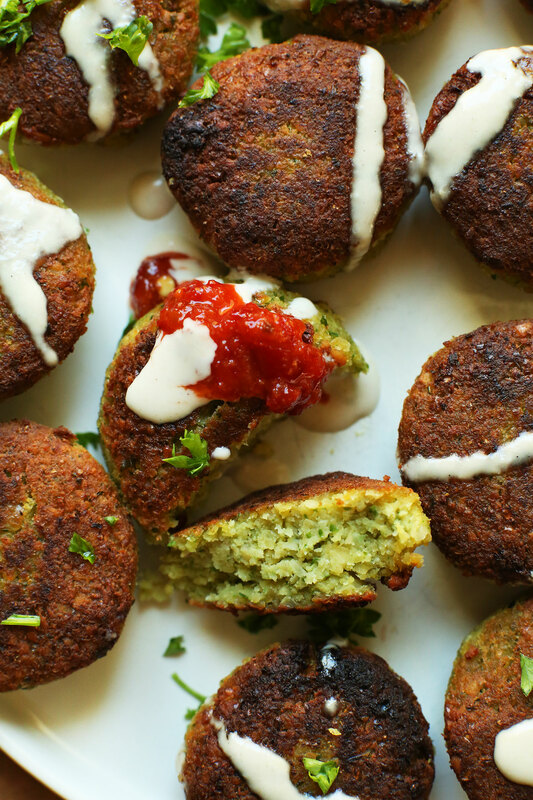 I have always loved all your falafel recipes, so this is definitely a must-try!!! Mmmm, these look so delicious!! I need to make some asap! Gorgeous pictures too by the way! Ohhh Dana, how am I supposed to keep up with them all?! I just made the “Better Than Restaurant Falafel” for the first time last night. It was wonderful and I loved how easy that recipe was (and that I got to use up the swiss chard in my garden)! Those are good, too! These are just closer to “traditional.” Hope you give these a try, too! I recommend Cedo’s on MLK for another good falafel place (aside from Wolf & Bear’s). I recently found it and I think it may be the best I’ve had! It would be very helpful to have Weight Watchers points included in the nutrition. Thanks for the suggestion, Jan. But we won’t be adding Weight Watchers points at this time. I forgot to mention as a busy mama of three rolling out and baking/frying individual falafel is sometimes too much work. I often spread my dough on a piece of parchment and cut into squares then brush with olive oil, separate a little bit and bake them, it makes the falafel making game so much more manageable and you still get the same great taste. I also Ada pinch of cayenne from but if heat. Smart!! Thanks for the tip! I need to try your recipe(s) Asap!! Nice! I’ll have to check them out! Can these be baked and if so at what temp and time? If I already have cooked chickpeas from dried, do you know the measurement? Or would it work the same? well, you don’t want them COOKED you only want them SOAKED. Otherwise they’ll be too soft. So I’d recommend measuring out dry beans as suggested and either using the quick soak method listed above, or soaking them overnight! This looks incredible! I’ll definitely have to try it! Oh my gosh. Yum! These look so good. Falafel is one of my favorite things to order at restaurants but have only made it at home a couple of times since it’s a lot of work. This recipe makes it look easy though! Think I’ll give it another go. you can never have too many falafel..i made a batch last week and enjoyed them with pizza (crumbled as topping) and with salad. i cant wait to try this pan fried version. looks so soft! This sounds amazing! Is it ok if I use canned chickpeas? I have so many I need to use up lol. Thanks in advance! Is there a specific reason or any expected difference in outcome if the canned one is used? Thanks! Hi Flavia! We recommend dried as you don’t want them cooked you only want them soaked, otherwise they’ll be too soft. So I’d recommend measuring out dry beans as suggested and either using the quick soak method listed above, or soaking them overnight! Hope this helps!